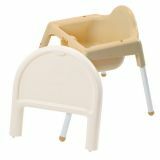 Keep everything conveniently organized and easily adjust to fit on the kitchen bench, sink or table. 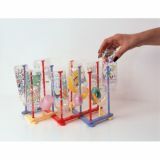 They are made with hard-wearing plastic in fashion colors. 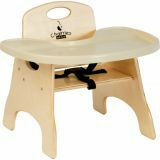 Easily adjusts to fit on the sink or table. Folds to a compact size for easier storage when not in use. 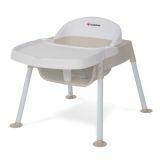 The new, Secure Sitter Premier™ feeding chair is your single solution to feeding chair height needs. 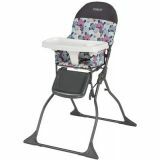 Adjustable to four popular heights (7", 9", 11", 13") to allow children's feet to properly rest on the ground. 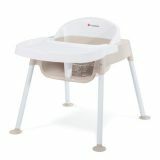 This easy-to-clean feeding chair provides maximum comfort and enables children to self-load with minimal assistance from the caregiver. 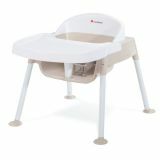 Tip & Slip Proof Feeding Chair! 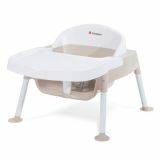 No tip feet provide stable base to keep chair securely on the floor. Three point adjustable harness keeps child safely in place. Smooth surface makes it easy to clean and sanitize. Trays can be removed quickly and easily by pressing the triggers underneath the tray and lifting up. Chairs stack 4 high for space saving storage. Additional shipping charges apply. 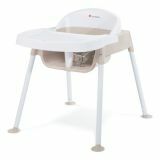 Tip & Slip Proof Feeding Chair! 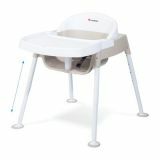 No tip feet provide stable base to keep chair securely on the floor. Three point adjustable harness keeps child safely in place. Smooth surface makes it easy to clean and sanitize. Trays can be removed quickly and easily by pressing the triggers underneath the tray and lifting up. Chairs stack 4 high for space-saving storage.